At the recent G20 summit, finance ministers discussed closing loopholes that allow multinational corporations to stash profits in offshore tax havens such as the Cayman Islands and Bermuda. In the U.S., Senator Carl Levin has introduced the “Stop Tax Haven Abuse Act” to prohibit U.S. corporations from avoiding paying taxes on their offshore income. NerdWallet Taxes conducted a study of the Fortune 50 to find that 88% are stashing profits in foreign subsidiaries. But just how much tax revenue is at stake? Our analysis reveals that the top 20 companies account for roughly 50% of the Fortune 500’s $1.6 trillion total in offshore earnings, collectively earning $743 billion in total profits. While each company reported its offshore profits, only six provided an estimate of their U.S. income tax liability if they repatriated those profits. All other companies reported that providing an estimate would not be “practicable,” so we assumed that their net tax rate on offshore earnings would be the U.S. rate of 35% minus the foreign tax rate they paid. Combined, the top 20 companies would owe an estimated $119 billion in taxes on their offshore profits. GE tops the Fortune 50 list with $108 billion in foreign earnings. If it were to bring these earnings back to the U.S., G.E. would pay at least $3 billion in U.S. federal income taxes. This estimate is conservative because actual U.S. tax rates on its foreign earnings are likely to be higher; it is likely that GE did not pay foreign income taxes on all of its cumulative earnings, especially if it stored any of those profits in tax havens. Microsoft ranks 2nd with $76.4 billion in offshore earnings and paid the third lowest rate of 9% in foreign income taxes. It estimates it would owe $24 billion to the IRS on its offshore profits. The pharmaceutical giant earned a total of $73 billion in offshore profits, and net of the 16% tax rate paid to foreign governments, would owe an estimated $14.1 billion in taxes to the IRS. Pfizer notes that it benefits from lower taxes and manufacturing incentives granted to its subsidiaries in Puerto Rico, Ireland and Singapore. IBM earned $12 billion, or 57% of its total pre-tax income, from foreign sources. It paid $3 billion in taxes to foreign governments, averaging a 25% tax rate. The company accumulated about $44 billion in offshore profits and would owe approximately $5 billion to the IRS if it repatriated those earnings. Exxon earned the majority (86%) of its total pre-tax income from foreign sources. It earned $67 billion in overseas operations and paid $26 billion in taxes to foreign governments, effectively a tax rate of 38%. Because it paid a higher tax rate to foreign governments than the standard U.S. rate of 35%, we assumed it would use foreign tax credits to reduce its U.S. income tax bill to a negligible amount. Citigroup had the 6th highest level of offshore earnings at $42.6 billion. Surprisingly, even with these profits and company-wide pre-tax income of $7.9 billion, it paid virtually no taxes. Instead, it deferred $5 billion in U.S. taxes and reduced its actual tax rate to 0.3% due to audit settlements and tax advantaged investments. P&G earned $42 billion in offshore profits, and paid 24% in income taxes to foreign governments. We estimate that it would pay at least $4.4 billion in taxes to the IRS should it repatriate its offshore earnings. The second pharmaceutical giant in our top 10 list, Johnson and Johnson was able to shave off about 4% from its 35% U.S. tax rate thanks to operations in Puerto Rico and Ireland. The company has accumulated $41.6 billion in offshore profits and paid 14% in taxes to foreign governments. We estimate that it would owe at least $8.7 billion to the IRS on its offshore profits. Apple had the lowest effective foreign tax rate of 3% of all the Fortune 50 companies, and thanks to $5.9 billion in 2012 foreign earnings, it was able to reduce its U.S. tax liability by 28%. Apple currently has accumulated more than $40 billion in offshore earnings and estimated that it would owe $13.8 billion in taxes. It currently is under investigation by the Senate Permanent Subcommittee on Investigations for its tax strategies involving its subsidiaries in Ireland. HP cumulated $33.4 billion in offshore profits and operates subsidiaries in “jurisdictions with favorable tax rates” such as Singapore, the Netherlands, China, Ireland and Puerto Rico. It notes in its annual report that “as a result of certain capital investments HP has undertaken, income from manufacturing and services in certain countries is subject to reduced tax rates, and in some cases is wholly exempt from taxes, through 2024.” We conservatively estimate that it would pay at least $7.3 billion in taxes to the IRS if it repatriated its offshore profits. Bank of America had $3.1 billion in pre-tax income but actually received a U.S. tax credit of $1.1 billion for 2012, all while accumulating $17.2 billion in offshore earnings. It received a tax credit because of high foreign income taxes, tax exemptions on certain classes of income, and heavy use of low-income housing credits. Warren Buffett’s Berkshire Hathaway has accumulated $7.9 billion in offshore profits but notes that any U.S. income tax liability on these earnings would be “immaterial” thanks to tax credits arising from income taxes paid to foreign governments. Individual company information was obtained from the 2012 10-K filing. Negative actual tax rates paid to the U.S. reflect tax credits. 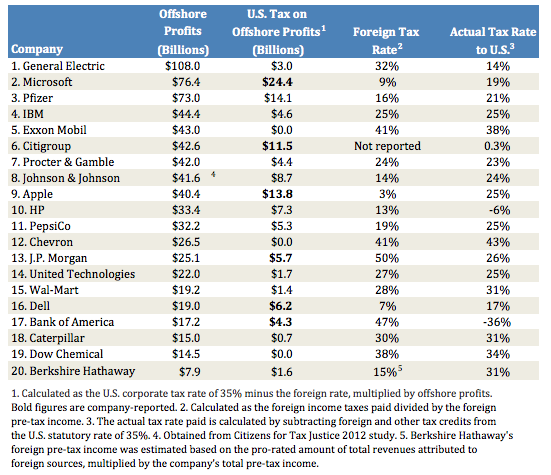 Companies with zero U.S. income tax on offshore profits have paid a foreign tax rate above 35%.